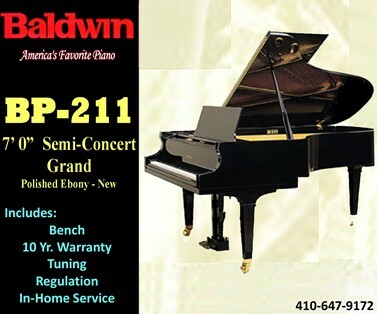 Baldwin BP-211, 7' Semi-Concert grand is sheer perfection. be the answer to your dreams. Professionals call it the 'vertical grand. 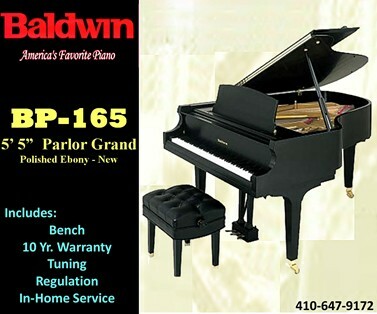 soundboard area as Baldwin celebrated R1 grand piano. cabinetry, and grand-style lid prop. 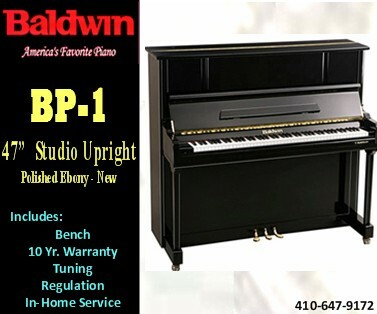 from Baldwin, at a price that makes it accessible to any budget. 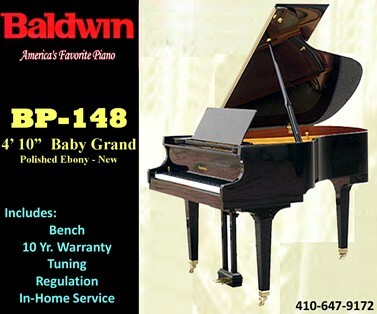 All Baldwin Grands feature Hard Rock Maple Rims. Using Hard Rock Maple gives a piano greater volume, enhance harmonics and more dynamic range. With very few exceptions all of the top-rated hand-built pianos use Hard Rock Maple Rims. Baldwin plates are made using a sandcast process which results in high-strength, stress-free castings. 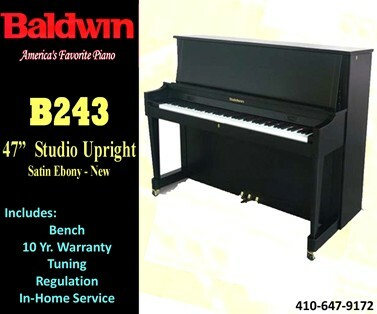 This sandcast process, combined with the use of premium iron ore, produces a plate that does not contribute unwanted resonance, thereby helping to create the classic Baldwin Sound. Baldwin bridges are constructed of solid maple. 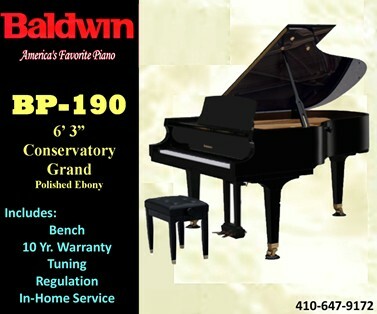 This design contributes to the sustaining tonal quality of the Baldwin piano. Ribs, crafted of premium spruce, are hand selected and matched to each soundboard for maximum stability. 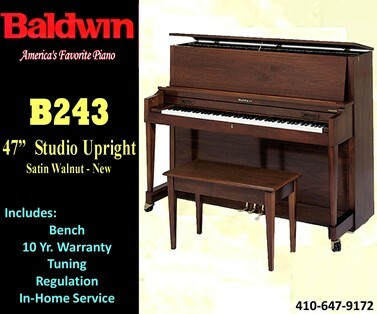 Baldwin piano pinblocks consists of multiple plies of hardwoods. By alternating the grain direction of each ply, tuning pins are snugly held. Because the plies are joined with a waterproof adhesive, the integrity of the Baldwin grand pinblock is not adversely affected by humidity. 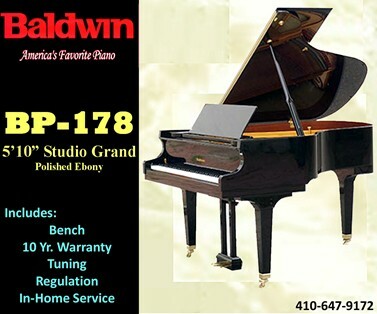 Consisting of more than 7,500 parts, theBaldwin action features the exceptionally responsive touch that professional players prefer. 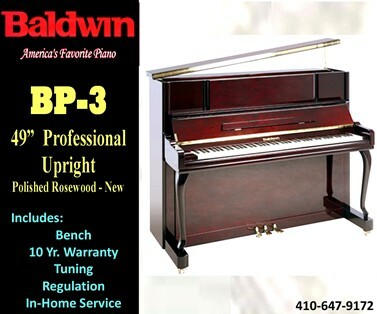 Baldwin only uses premium hammers to ensure world-class, note-to-note consistency and excellent tonal range. For more than 60 years, Baldwin has been honored to share the stage at a variety of orchestral and chamber music concerts, instrumental and vocal recitals, student performances, the Festival of Contemporary Music, and performances by both popular and jazz artists. Grand Palace Theatre, Branson, Mo. Baldwin's support of performing artists and institutions is a tradition which dates back to the early years of the 20th century. Today, our Concert & Artist Division, based in New York's Hit Factory building on West 54th Street, is the center for our international activities. Baldwin Artists span all musical genres, from jazz to pop, classical to country. We're proud of the breadth and depth of our roster, which continues to grow. 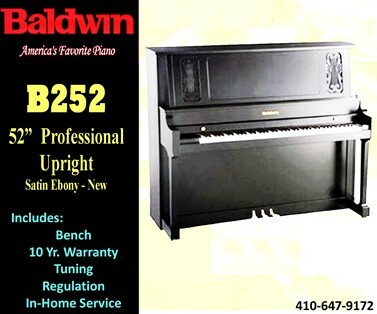 Baldwin Artists are not paid for their endorsements. 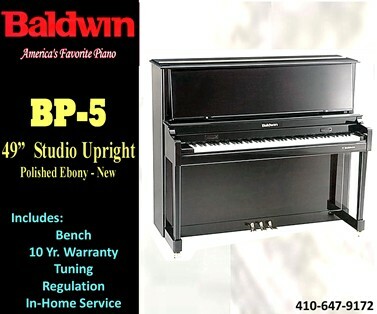 Rather, their preference is a testimony to the performance characteristics of Baldwin pianos.